This post was originally published on The Conversation US. Marvel’s blockbuster “Black Panther,” which recently became the first superhero drama to be nominated for a Best Picture Academy Award, takes place in the secret African Kingdom of Wakanda. The Black Panther, also known as T’Challa, rules over this imaginary empire – a refuge from the colonialists and capitalists who have historically impoverished the real continent of Africa. But fans of the box-office hit might not realize that they don’t need to look to the make-believe world of the Black Panther to find a modern-day black kingdom that aspired to be a safe haven from racism and inequality. The fictional kingdom has a real-life corollary in the historic Kingdom of Hayti, which existed as a sort of Wakanda of the Western Hemisphere from 1811 to 1820. The Haitian Revolution led to the creation of the first free black state in the Americas. But the world was hardly expecting a former enslaved man named Henry Christophe to make himself the king of it. Media accounts from the era, some of which I’ve collected in a digital archive, serve as a window into a brief period of time when the kingdom stood as a beacon of black freedom in a world of slavery. Yet, like Wakanda, the Kingdom of Hayti wasn’t a utopia for everyone. On Jan. 1, 1804, an army led by former enslaved Africans in the French colony of Saint-Domingue staved off France’s attempt to bring back slavery, and declared themselves independent and free forever. The leader of the revolutionaries, General Jean-Jacques Dessalines, had defeated Napoleon’s famous army and made himself emperor of the newly-renamed Haiti. But in October 1806, Dessalines was assassinated by political rivals, leading the country to be divided into two separate states: General Henry Christophe named himself president of the northern part of Haiti, while General Alexandre Pétion governed a completely separate republic in the southern and southwestern part of the country. 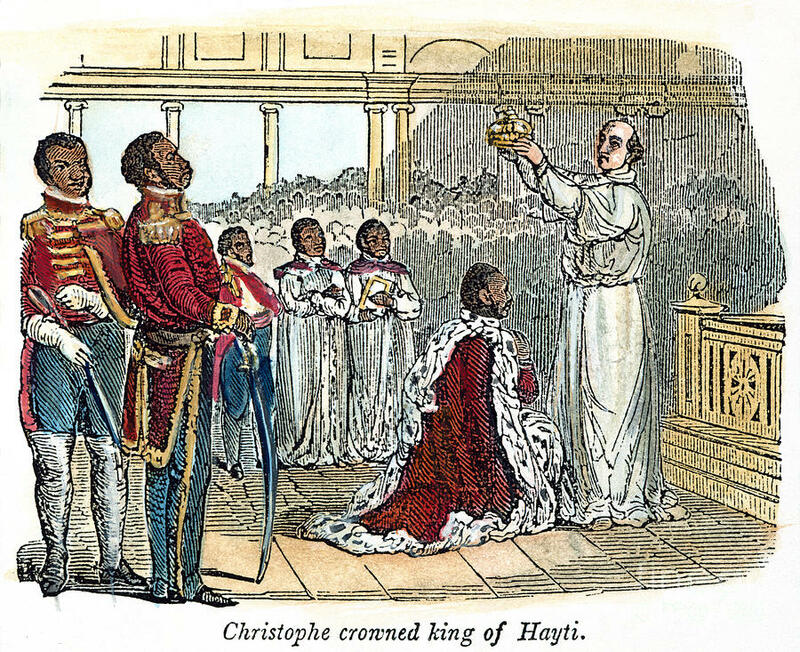 In March 1811, President Henry Christophe surprised everyone when he anointed himself King Henry I and renamed the northern republic, the Kingdom of Hayti. Henry I soon had a full court of nobles that included dukes, barons, counts and knights to rival that of royal England. Haiti’s first and only kingdom immediately attracted the attention of media outlets from around the world. How could there be a republic on one side of the island and a monarchy on the other, they wondered? Was the new black king trying to mimic the same white sovereigns who had once enslaved his people, others asked? The edicts establishing the royal order of Haiti were immediately translated into English and printed in Philadelphia, while many American and British newspapers and magazines ran celebrity profiles of the Haitian king. In 1813, construction of the opulent Sans-Souci Palace – meaning literally “without worry” – was completed. The palace was partially destroyed by an earthquake in 1842; today, its remains have been designated a world heritage UNESCO site. During its heyday, the palace dazzled. King Henry lived in the palace with his wife, Queen Marie-Louise, and his three children, Prince Victor Henry, and the princesses, Améthyste and Athénaire. An April 1815 issue of The Gazette Royale details how the Kingdom of Hayti foiled France’s attempt to reconquer its former colony. Newspapers around the world reprinted articles from the monarchy’s official newspaper, the Gazette Royale d’Hayti, detailing the royal family’s lavish dinners, replete with bombastic speeches and lengthy toasts to famous contemporary figures such as King George III of England, U.S. President James Madison, the King of Prussia, and the “friend of humanity,” the “immortal” British abolitionist Thomas Clarkson. There was much more to King Henry’s reign than luxurious parties. “Nothing that white men have been able to arrange is equal to it,” he added. The code provided for shared compensation between proprietors and laborers at “a full fourth the gross product, free from all duties,” and it also contained provisions for the redistribution of any land that had previously belonged to slave owners. Yet life in the Kingdom of Hayti was far from perfect. Henry’s political rivals noted that people frequently defected to the southern Republic of Haiti, where they told stories of the monarch’s favoritism and the aristocracy’s abuse of power. Worse, Henry’s famous fortress, the Citadelle Laferrière, was, according to some accounts, built with forced labor. For this reason, Haitians have long debated whether the imposing structure, which was restored in 1990, ought to symbolize the liberty of post-independence Haiti. Henry’s dreams of a free black kingdom would not outlive him. On Aug. 15, 1820, the king suffered a debilitating stroke. Physically impaired – and fearing a fracturing administration plagued by the desertion of some its most prominent members – Haiti’s first and only king killed himself on the night of Oct. 8, 1820. For all those who still dream of black liberation, strong – if ultimately flawed – leaders, like both the King of Hayti and Black Panther, have always been central to these visions. Marlene Daut is Associate Professor of African Diaspora Studies, University of Virginia. She is also the author of Tropics of Haiti.